← The animal trough and remembering Mr Winston. In his book “Rhyl, The Town and Its People” Mr. J.W. Jones described how, in November 1897, it was announced that Messrs Charles Connah of Rhyl had ordered a motor car for a Rhyl purchaser. Mr Connah had a cycle shop next to the Queen’s Hotel and the purchaser was Mr. C.H. Palethorpe of “Killiney”, Marine Drive. It was delivered early in 1898 and J.W. Jones reported that there was great excitement in the town as its made its way noisily through the streets, frightening the horses and bringing out shopkeepers and tradesmen to their doors to watch its progress – followed by most of the town’s little boys and quite a number of older residents too. In April 1898 Mr Palethorpe wrote a letter to the Rhyl newspapers describing his first trip in a motor car from Rhyl to Birmingham. He explained how he had waited to buy a car until he could have one that was entirely English built. The makers of the car were Messrs Arnold and Sons, East Peckham, Kent and was one of the first three English built on the Benge (sic.) system (probably Benz). He goes on to describe his journey, noting that the average speed was just over 10 miles per hour, and that she arrived back in Rhyl as perfectly as she had started out, with not the slightest mishap. They saw no “fingerposts” until they reached Salop, consequently they lost their way twice on the journey. “Sir, – I was very interested in Mr. J. W. Jones’ article under the above heading, and I think I may be able to add something of interest. As well as being a pioneer of the Cinema, my father, Mr Arthur Cheetham, also introduced electric light into Rhyl, lighting his own house and shop, No. 30 Queen Street and the next door shop. As this was the only source of electricity in Rhyl, Mr. Palethorpe had to bring his car there to have his batteries charged. It was, of course, a petrol engine but used batteries for ignition. I saw quite a bit of the car on these visits. It was a dog-cart with wooden wheels and iron tyres, the rear wheels perhaps 3’6″ and front wheels about 2′ in diameter. It looked like its horse drawn version. It was steered by a tiller. The single cylinder engine was under or just behind the seat, with wooden shutters. When these were removed the engine could be plainly seen at work. The piston with connecting rod and crankshaft were all uncovered. They were lubricated by drip feed from small glass lubricators. 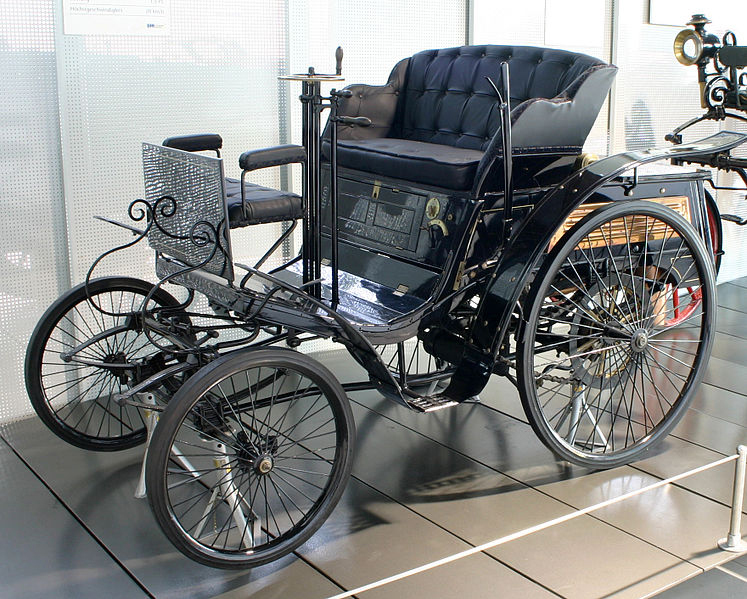 The driving belts were flat belts similar to those used in a workshop to drive lathes and drills, and actuated in a similar way by forks which caused the belts to slide from loose to fixed pulleys, thus starting the car. The speed was changed by using a different pair of pulleys.